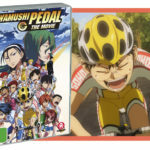 High school student Nagai Kei’s life takes a turn for the worst when he is hit by a truck while walking home from school and he doesn’t die. In fact, it’s quite the opposite – while the impact definitely kills him, Kei doesn’t stay dead. His premature and impermanent death reveals that Kei is an Ajin, a breed of ‘demi-human’ that is unable to be killed and is sought after by the governments of the world to be used as a valuable specimen in inhumane experiments. 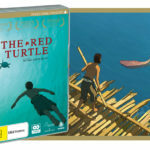 To escape a life of imprisonment and torture, Kei goes on the run with the help of his childhood friend Kai, trying to avoid those who would sell him out to international hunters or the Japanese government. But bounty hunters and lawmakers aren’t the only ones looking for him, as the nation-wide search draws the attention of other Ajin who have their own interest in Kei. I initially discussed Ajin: Demi-Human two years ago while writing an article on my first impressions of the show. Since then it’s become a series that I’ve had an ongoing interest with and while I avoided the live-action movie adaptation, I’ve become a casual fan of the manga. It’s definitely a strange series, with a premise that lends itself to exhibiting extreme violence since a fraction of its main characters cannot die, and a genre that can best be described as a little ‘wonky’ because of the narrative’s mixed priorities. These priorities are the experiences of Kei as a new Ajin vs Sato, a dangerous Ajin who enjoys violence and waging war with non-Ajins for his own amusement. Because of this split in perspectives, Ajin: Demi-Human often feels like two shows. One show follows Kei and is about establishing the ‘mythos’ of Ajin, exploring their lives as immortal beings, their different abilities and how they are dehumanised by their communities and hunted by their governments. This part involves some fun pseudo-science about how Ajin physically and biologically function according to the world’s internal logic and shows Kei exploring his own limits and abilities. These abilities range from an Ajin’s scream which can cause temporary paralysis and the ability to summon an ‘IBM’, a ghost-like creature that can be controlled to do an Ajin’s bidding. 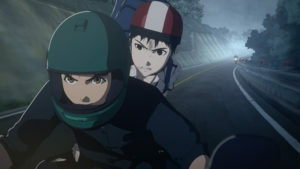 The alternate parts of the show are about Sato creating an Ajin terrorist group to inflict as much chaos as possible, which was interesting when it explored the different tactics an Ajin could use to weaponise their immortality. However, more often than not these sections felt over indulgent to me and like an excuse to manufacture what-if scenarios more interested with the logistics of how a single person with an Ajin’s abilities could take on armed forces rather than anything truly meaningful or interesting. I understand that this is actually the basis of most narratives – exploring scenarios with a new and interesting gimmick. But Sato and his goals felt particularly distracting to the aspects of Ajin: Demi-Human that I enjoyed. This is exacerbated by the fact that I don’t find Sato particularly compelling as a character. 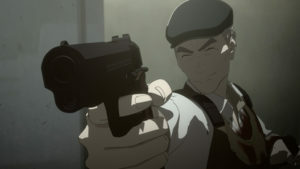 In fact, my interest in Sato as a character dwindled around the halfway episode mark of Ajin: Demi-Human, to the point where I felt like his story interfered with the main narrative of the series. Which I know for a fact is false because Sato’s actions specifically progress the stories of Kei and other characters in the show, but it still felt like those sections took up time at the expense of much more interesting stories and characters. 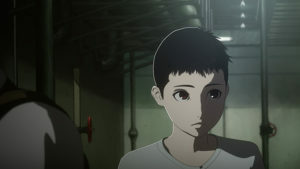 The result of this unsuccessful duality is a show with suspense and horror elements rooted in a grounded supernatural setting that feels rich and mysterious when it’s exploring Ajin and their abilities from Kei’s perspective, but bloated by an obsession with militaristic scenarios whenever Sato is on screen. A fascinating and perhaps deterring aspect of Ajin: Demi-Human is how gruesome it is. It generally doesn’t shy away from the miseries inflicted on its Ajin characters, exploring how their abilities can be weaponised, exploited, and how such little value is placed on their well-being because they can’t truly be killed. This is shown through how Sato casually cuts off his limbs while fighting to avoid being drugged and captured, and when citizens attack and even kill Kei to try and prove he is an Ajin to collect reward money. 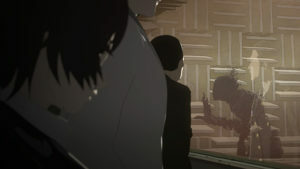 But despite the subject matter of Ajin: Demi-Human and its portrayal of immortal people who are dehumanised to the point where they are viewed as commodities for government experimentation, the show does not entirely embrace the horror of this concept – in fact, the gorier aspects present in the manga are sanitised. In the manga Kei cuts his fingers off and places them in a strategic spot to distract an enemy who is searching for him. The anime recreates this scenario but substitutes the fingers for a shoe. 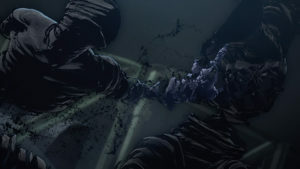 An intense medical torture scene is also stripped right back and made more palatable, but it still hits those necessary beats to show the extent of dehumanisation that Ajin suffer and the themes of the show. If the gory horror aspects of the manga were your jam, be prepared for the show to soften some of the more intense scenes. At the same time, if you’re squeamish and would rather skip some gratuitous violence, this one might not be for you. Along with its gory premise, the visuals of Ajin: Demi-Human are another factor that may deter viewers. The animation is 3D and done by Polygon Pictures, who you may know for their work on another series, The Knights of Sidonia. My comments from the first impressions article about the animation style are still applicable. The show seems to have a low frame rate that makes movements and expressions on the 3D character models look jarring. On the other hand, the lighting of scenes is noticeably beautiful, and the show looks good when characters are still (which I know sounds like a weird compliment, but it’s the truth). At the very least, the animation style is distinct. The performance from the Japanese voice cast is also excellent, and it’s hard to unhear them when watching the English dub. That isn’t to say that the English dub isn’t solid, because it certainly is. But some of the voices don’t seem to fit the ages of the characters or their designs. But this may just be because I listened to the Japanese version before the English dub, I doubt it is as distracting if you launch straight into English audio. Despite its many shortcomings I have a soft spot for this show. I enjoy its themes, a majority of its characters and think the darker aspects of the series make it fairly compelling. 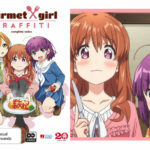 If you’re a fan of the manga and like the series for its horror aspects, you may have less interest in the anime for watering down these elements. Similarly, if you’re like me and get sick of the extended fights involving Sato and a hapless military group there will be times when the show bores you. 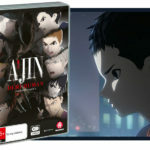 Thankfully if you’re on the fence about watching Ajin: Demi-Human and you have Netflix, you can scope it out there first – it’s easy to get a feel for the show from the first and second episodes. 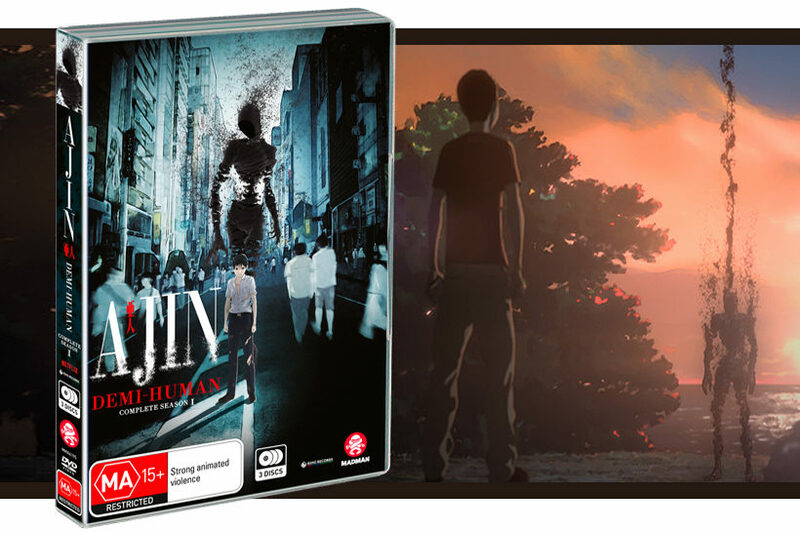 While it may not be anywhere within the realm of perfect, I still think that Ajin: Demi-Human is at least memorable and warrants a quick watch to see whether it peaks your interest. © Gamon Sakurai, KODANSHA/AJIN Production Committee.